Ah, Hong Kong! I lived here in 1998-99 and ever since it has been one of my favorite cities. It has the cosmopolitan nature of New York, the civilized infrastructure of a former British colony, the good food of anywhere with a large Chinese population, and the awesome views thanks to the close proximity of hills and harbour. Whenever I’m back in Hong Kong, I feel like I’m back home. With all the good Chinese food here in Hong Kong, it might seem a little strange to begin my food entries with a sushi restaurant, Sushi One. This place was not only near our hotel but it was also well-reviewed. To top it off, it was open late and offers 50% off the sushi after 10:00 pm. 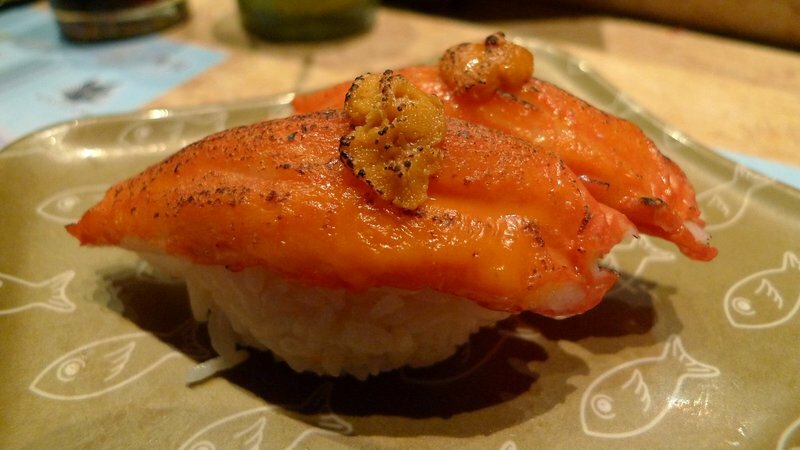 Sushi One has several locations throughout Hong Kong. 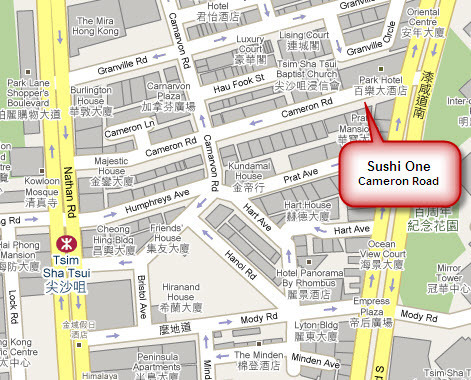 We chose the location on Cameron Road (near Chatham Road) in Tsim Sha Tsui, Kowloon. There is a row of fish tanks along one wall with a series of small tables surrounding the sushi bar in the center of the room. A conveyor system was in place but pretty much everyone was eating sushi to order. 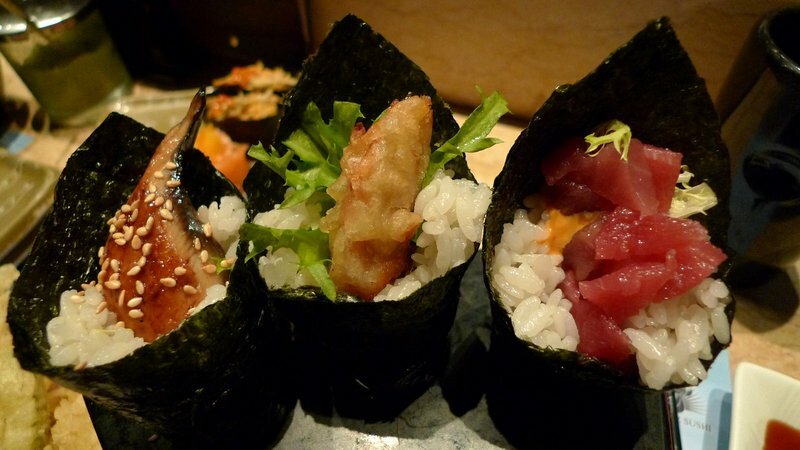 We found the sushi to be of high quality with fresh flavors and good attention to presentation detail. Plus, with the half-off discount on the sushi (although not on appetizers and other plates) our total bill was about HK$170 – about US$23. Not too bad. Seared crab stick with uni – sea urchin roe. They did several seared dishes, which adds a nice flavor and texture contrast. 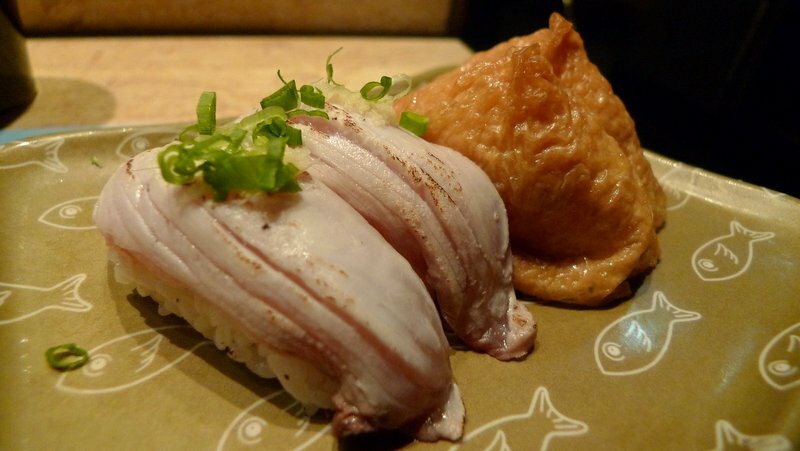 Left: Seared Hamachi; Right: Inari – sushi rice wrapped with tofu skin. 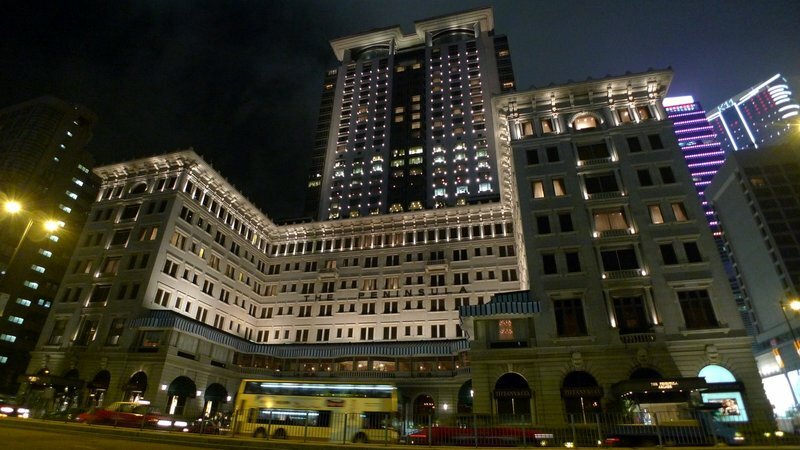 A nighttime shot of the venerable Peninsula Hotel facing the Hong Kong harbour. This entry was posted in Uncategorized and tagged Dining, food, hong kong, Kowloon, Sushi, Sushi One, travel by christao408. Bookmark the permalink. So, you are presently in Hong Kong. Sushi looks amazing and cheap! So jealous. That whole meal would have been at least 100 bucks at the fancy sushi eateries here in LA. I’m not a fan of sushi but this looked tempting… maybe I’ve just never tried good sushi. 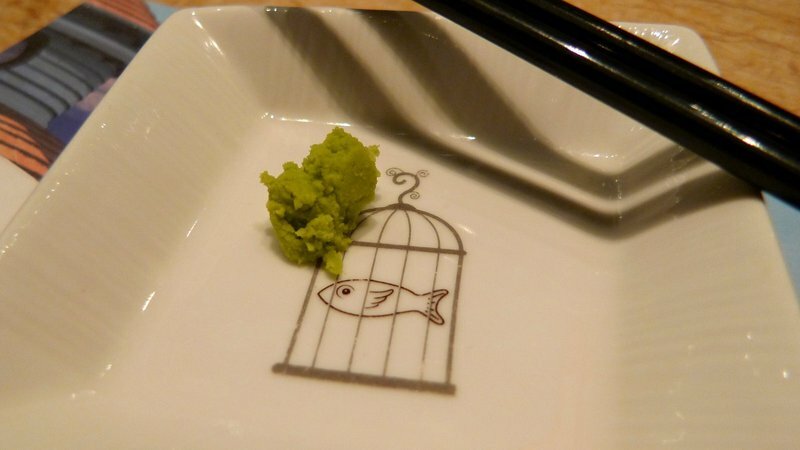 Sushi One. ❤ I really can’t believed you posted this. Sushi one has been my favourite japanese restaurant out of all the ones I’ve ever been to in anywhere. 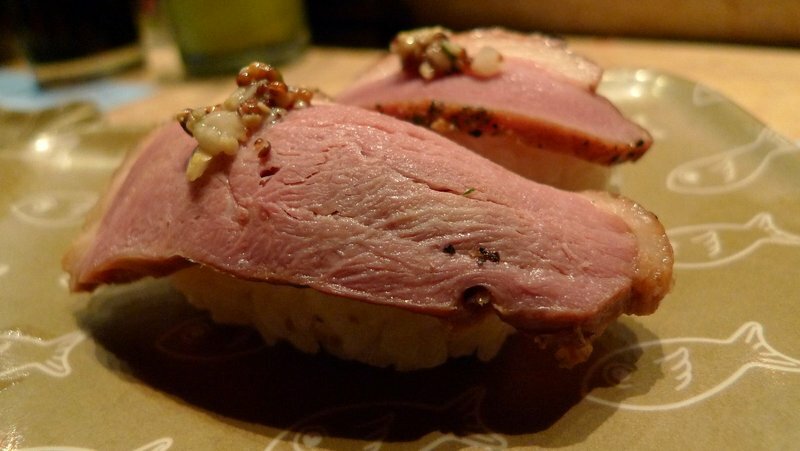 My favourite is the beef nigiri which simply just melts in your mouth. It doesn’t appear that you have tried it. And I absolutely love the fish tanks there. It’s so pretty. I’m not sure if I’m imagining this or if I am actually recalling this from memory, but I think they had seatings there in which you would be seated in something that resembles the cage in their logo? Ah Hong Kong I have been there on a layover to Australia. It was really long layover so I took the fast train into the city and walked aound. It is beautiful in a different way. Airport was pretty radical especially if your flight left at gate 127. Sadly I spent my money on a Starbucks – it was the first one I had ever seen – instead of local food. yum, that sushi looks so good! i wish we had good sushi up here, but i haven’t found anywhere worthy of that title yet. I want some now! I love sushi and just hate that it’s so (relatively) expensive here in India. go to SIFT.. hurry!! it’s good dessert there. look it up!! Oh you make me jealous. HK is probably the best city in the world. I have sat on the street with no visa, no job and no plan, drinking mango juice and thinking WTF do I do now. Gosh I crave uni.That is so cheap. Your introduction paragraph is very well said and I totally agree. I need to try Sushi One next time I visit Hopng Kong this summer. By the way, you stayed at the Penisula? wow! I wish I could afford that. yummmmmmmm time to try it this summer ! any other great places to eat in HK or Shanghai? Oh gosh that looks heavenly and so cheap! I wish I had known where to find sushi like that in Japan; I hadn’t the slightest clue. My parents would’ve liked the seared ones better than the plain raw kind. I have minimal sushi experience. Your post makes me want more. The sushi looks so pretty. I like to take these pictures and stick them into the faces of sushi chefs in US that cannot even make a decent nigiri. 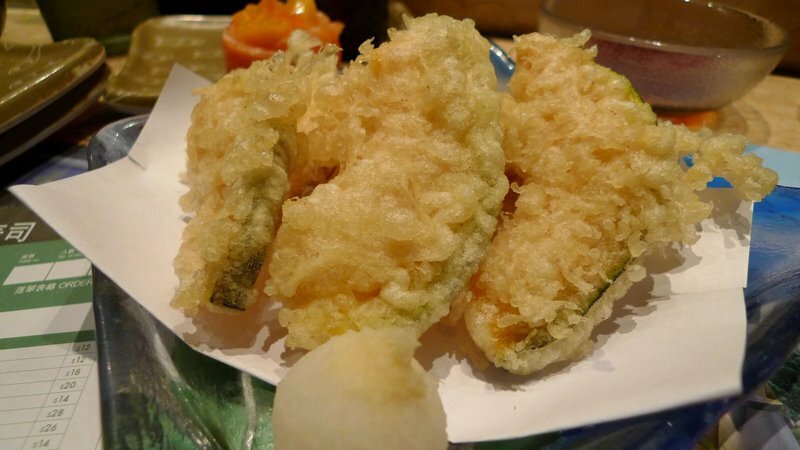 Tempura pumpkin? What was that like? I would not mind living in HK for some time. At the very least it would help me out tremendously with my Canto! I love that first pic with all those lights on at night, I was trying to picture the same scene without all the cloud above but with the sky full of stars. That would make an amazing scene. A great pic too of the hotel – that part that ‘looks’ like it’s sitting on top of the ‘set back’ part of the hotel, is it part of the hotel or is it a different building sticking up behind it ? Hmmm I see the buses over there are pretty much the same as ours – strange how one expects to see something completely different LolThose fish tanks would grab my attention for the entire duration of the meal!Great pic of Tawn 🙂 There’s a couple of guys in black who appear to be working behind the counter – is one of them wearing a face mask ?As for all the food pics – as usual all the dishes look lovely and appetising. I’d try that salmon and mango – though I’ve never had mango before, I do love salmon though. @stevew918 – I didn’t stay at the Peninsula – I walked by it! All I can afford…@Chatamanda – Can’t imagine you’d ever be able to see the stars if for no other reason than all the light pollution in HKG. The busses are largely the same thanks to the British colonial influence, I think. =) Regarding the hotel, the tower was an addition. The original hotel (the front portion) opened in 1928 and the tower was added in 1994. Of note, the Peninsula served as the Japanese headquarters during their WWII occupation of Hong Kong. @Roadlesstaken – With the increasing use of Mandarin, your Cantonese might not have much opportunity to improve, LOL. @TheCheshireGrins – Lovely tender slices of pumpkin with a crispy batter. Heaven…@Wangium – Feel free to use them for that purpose, Jason. 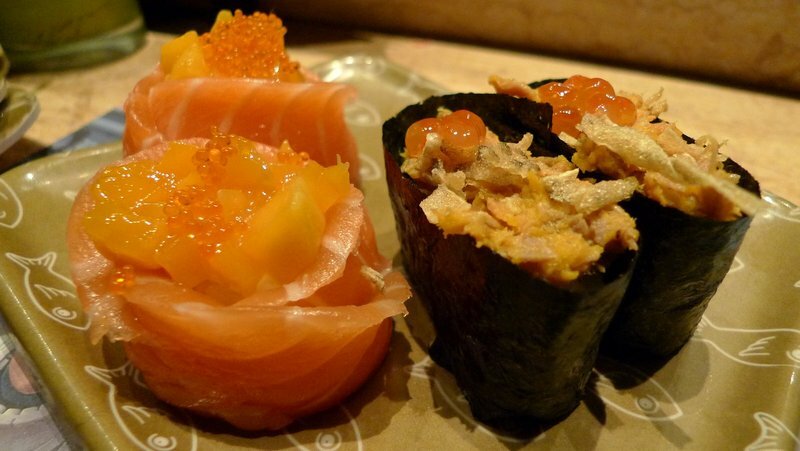 Anything I can do to better the quality of US sushi…@karila – Good sushi is wonderful. Bad sushi isn’t worth the effort. @Senlin – Tsukiji Market in Tokyo – see here: http://christao408.xanga.com/699783804/tsukiji-fish-market/@julieae – I’ll be writing about other HK places over the next few days and, if I can get my act together, will create a Google Map with all of them marked. As for Singapore, I haven’t been as impressed there with the food. I may have a few places written down somewhere, though. @CurryPuffy – I kept waiting for them to pull some fish out of the tanks and slice them up. Now that’s fresh…@yang1815 – Almost worth flying to Hong Kong for, isn’t it? 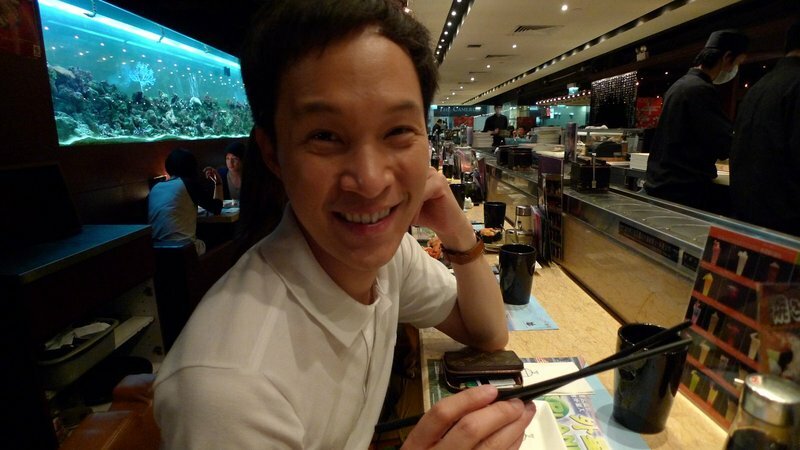 @christao408 – yes, but what we lack are japanese who will make good sushi! @kunhuo42 – Rats. Import some then? When I was in HK in 2000, it felt like home to me. When I was there last December, it felt strangely (and significantly) different… Still a great city though. @M_1 – It is interesting how over time one’s perception of, and feelings toward, a city can change. 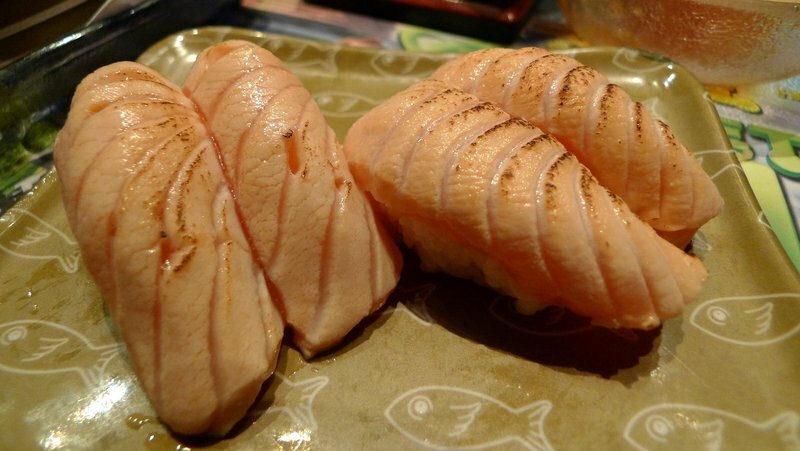 @Senlin – Agreed, the sushi at Tsukiji was really pricey. It was our last day there and we were low on cash so basically after we had our sushi, that was it for the rest of the day before we went to the airport! But I have to say, it was absolutely the freshest, highest-quality I’ve ever had… bar none. I really love your recaps of HK. Another fantastic meal!